Sometimes the internet shows up to the party dressed to impress. 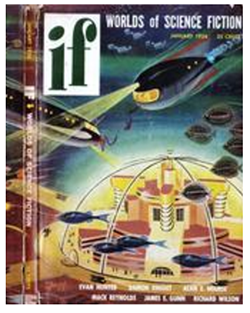 This past week was one of those times as the Internet Archive made the entire original 175-issue run of the science fiction magazine IF available for free download. If vintage pulp or vintage magazines are you thing, then is is something you definitely want to check out. The magazine ran from the early 1950’s to the early 1970’s. Each cover is like a time travel capsule to a different age. I think many are worth framing. There even seems to be a “bonus issue”? The very last issue posted at the Internet Archive is listed as Fall 1986 and declares a relaunch of sorts for the magazine, which closed in 1974. Not sure what happened to the rest of the run. IF magazine published serialized versions of many well-known science fiction authors like Robert Heinlein, Larry Niven and Harlan Ellison. According to the Internet Archive, IF magazine won three Hugo Awards for “best professional magazine” in the late 60’s. 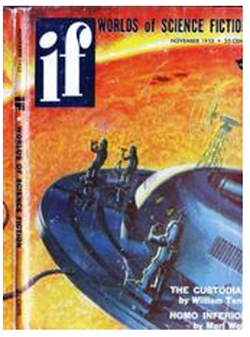 At the end of its run IF magazine was folded into the Galaxy Science Fiction magazine. So check them out, if science fiction is your thing. I’m also anxious to take a look and see who designed these covers. 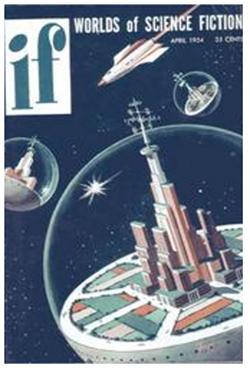 Too many great representations of vintage science fiction artwork here not to dig in deeper.